We chatted with businessman and author Glen Hall about his love of his adopted home, Northumberland, and how it inspired his new book The Last Druid. My love affair with books began when my primary school teacher gave me a copy of Prince Caspian when I was seven years old. Instantly captivated by the magic of C.S. Lewis’ Chronicles of Narnia, I could have wept when I finished the last book. Thankfully, I went on to discover the fantasy world of J.R.R. Tokien’s The Hobbit. It was during this time that I realised just how important these authors viewed landscape, but little did I know this was the beginning of a literary ambition I’d hold for the next thirty years. Like my favourite authors of old, landscape plays a hugely important part in my book, The Last Druid. Authors write from experience and, whether consciously or sub-consciously, favourite themes and places start to creep into their works. The Last Druid is no exception and takes place in three of my favourite places: Oxford, Gosforth and, of course, Northumberland. Originally from Bradford, my love affair with Northumberland began when I discovered the Northumberland Coast Route in 2000. I like the idea of ‘lost worlds’ and there are certainly elements of that in Northumberland – the most sparsely populated county in England. The people, landscape, history and mythology of this ancient county creates an edge land between the natural and supernatural, and in 2013 I realised the county was the perfect setting for the story I’d been cultivating in the back of my mind for a little while. The Last Druid had started taking shape. 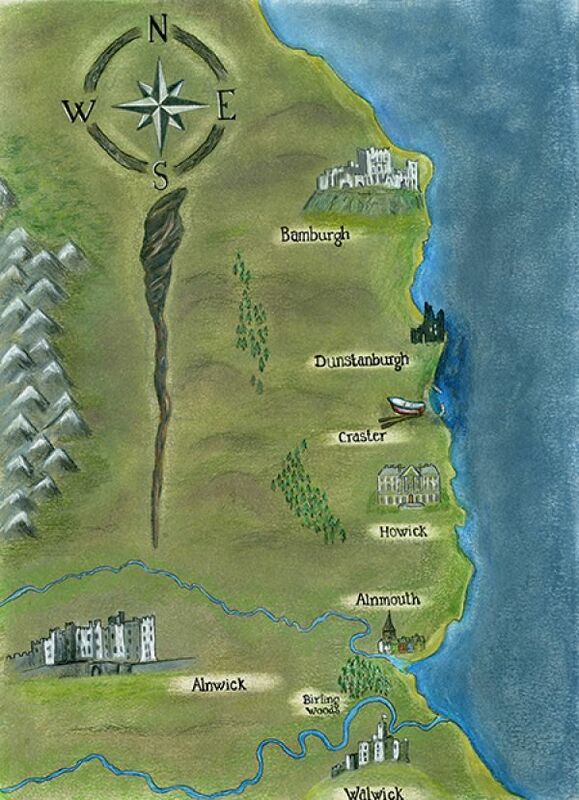 The characters in The Last Druid arrive in Warkworth with its castle sat atop the hill like a sleeping dragon. If you take the north road, you quickly find yourself in Alnmouth – literally the mouth of the Aln. A place to find sanctuary away from the hustle and bustle, with quaint rainbow coloured houses nestling aside a sweeping estuary. Next on the journey is Howick Hall, with its magnificent Gardens and Arboretum. Howick Hall was home to Charles, 2nd Earl Grey, who was Prime Minister during the early 1800s, the famous tea was blended especially for the water at Howick and named after him. I have spent many a happy day walking through its secret gardens before enjoying a cup of Earl Grey tea in the wonderful tearoom. From Howick Hall, it’s a short journey to Craster where you’ll find views of the imposing Dunstanburgh Castle ruins. There is something darkly exciting about this place that you cannot easily describe, like somewhere from a fairy tale. As you move through Beadnell, sat on a sweeping horseshoe bay, imagine the charge of the Forest Reivers. The road north cuts through Seahouses until you reach Bamburgh. I cannot easily describe the feeling the moment you see Bamburgh Castle standing atop its rocky perch, with its shadows sweeping down to meet the sea. Perhaps one of the most stunning views in the whole of Northumberland, Bamburgh plays an important part in the book and is the home of the Marcher Lords. Keep heading north through Bamburgh and out towards Budle Bay until you eventually arrive at Holy Island. This is a truly special place, connected to the mainland by a causeway across the sands, but cut off twice a day by the tides. Here tranquillity is steeped in a vast, and sometimes bloody, history. You’ll find the ruins of Lindisfarne Priory near the shore, and Lindisfarne Castle rises up on the tip of the island atop the same rocky crag as Bamburgh Castle known as the Whin Sill. In The Last Druid, Holy Island becomes the gateway between the Mid-Land (our world) and the Other-Land. If the Northumberland Coast creates the back drop for The Last Druid’s main narrative, then the Northumberland National Park creates an interesting sub-plot. 'The Last Druid' is my attempt to bring together my love of the literary, my love of business and my desire to give something back. The trilogy is a 5-year project, which I hope will make a big difference to a number of charities doing exceptional things for children and young adults in Northumberland and the rest of the North East. All royalties from The Last Druid will go to Cash for Kids, which supports children across the North East that have special needs or life-limiting illnesses, are suffering abuse or neglect, or simply need a little extra care or guidance.